The Intel® Edison Compute Module is designed to lower the barriers of entry for anyone prototyping and producing IoT and wearable computing products. 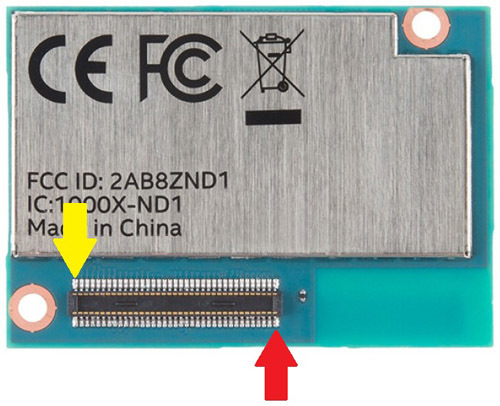 Because space saving in wearable designs is important, the Intel® Edison interfaces with end-user systems via a Hirose 70-pin DF40 Series header connector. The table shows the pin assignment of the 70-pin connector. This image calls out the locations of Pin 1 (red arrow) and Pin 70 (yellow arrow). The locations of the other pins follow a back-and-forth pattern, with Pin 2 being directly above Pin 1, and Pin 69 is directly above Pin 70.